Due to the unusually mild winter we have had, allergy season is rearing its ugly head a little earlier than normal this year! The signs and symptoms of allergies are usually itchy, watery eyes, runny nose, sneezing, and in some cases congestion. There are many options out there to treat your symptoms but no cures yet. The most common treatment for allergies are the antihistamines, but there are also many other products that you can get over the counter or by prescription if your doctor feels they are necessary. We will discuss the majority of those options in this blog as well. When you are exposed to an allergen that your body is sensitized to, your immune system jumps in to save the day. Cells in your body called mast cells release histamine. Histamine will attach itself to receptors in your body that cause blood vessels to enlarge, it also causes redness, swelling, itching, changes in the bodies secretions, and sneezing. Antihistamines block the receptors in your body where histamine binds, therefore decreasing or preventing your symptoms. Antihistamines most common side effects include drowsiness, dry mouth, dry eyes, and decreased urination. Who should not take antihistamines? Anyone with a prostate problem, trouble urinating, thyroid disease, nursing mothers, infants, kidney disease, emphysema, glaucoma, and individuals taking sedatives, sleeping pills, and muscle relaxers. If you are taking any other medications you should make sure to check with your physician or pharmacist before taking any additional products over the counter. The next product available to treat symptoms of seasonal allergies are the decongestants. Decongestants relieve the congestion associated with seasonal allergies. They are available as tablets, liquids, and nasal sprays. Decongestants work by decreasing the swelling in the tissues of your nasal passages. The swelling is what produces the abundance of fluid and mucous in your nasal passage. Decongestants shrink these tissues and blood vessels and relieve your symptoms. Nasal spray decongestants should only be used for 3 days at a time. Using those products for longer periods, or more often than directed on the package can actually cause your congestion to get worse, a condition called rebound congestion. Oral tablets can be used for longer periods of time safely. You should talk to your doctor before taking decongestants (oral or nasal spray versions) if you suffer from any of the following medical conditions. High blood pressure, heart conditions, glaucoma, thyroid disease, diabetes, or prostate problems. 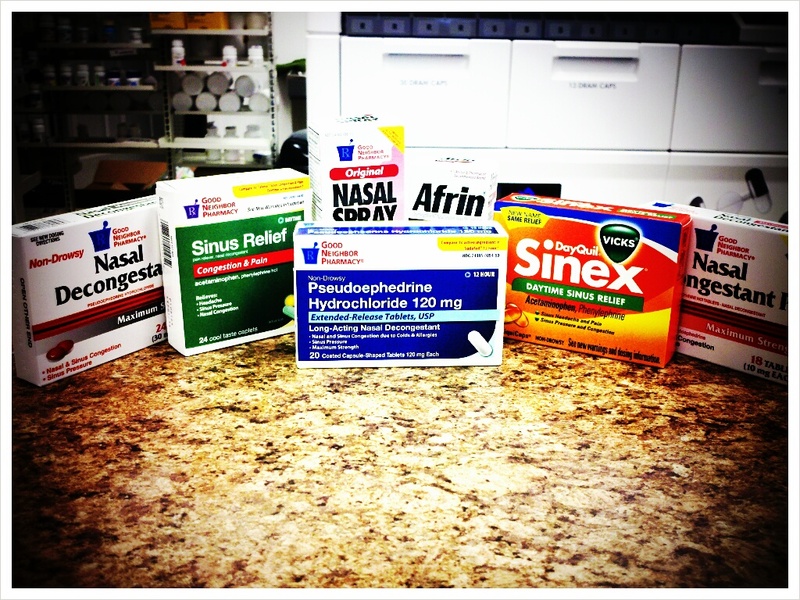 Over the counter products include Sudafed (pseudoephedrine), Sudafed PE (phenylephrine), Afrin, and Neo-Synephrine. 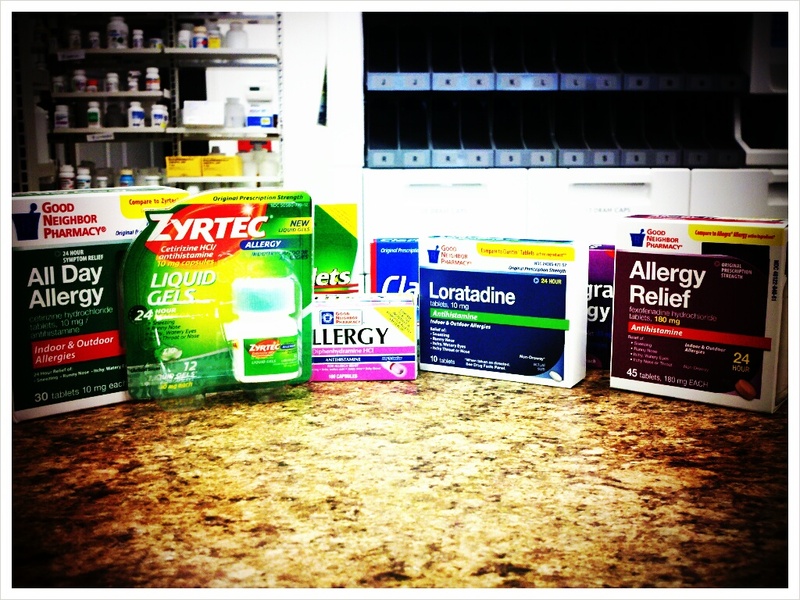 There are also many combination allergy products that contain both decongestants and antihistamines. Talk to your pharmacist to determine which product is best suited for your needs. Prescription decongestants include the same ingredients as the over the counter products, but are usually combined with another prescription only product like Clarinex-D. If your symptoms only include itchy watery eyes there are numerous eye drops available to treat your symptoms as well. These include antihistamine, decongestant, and redness reducing drops. There are a multitude of products available over the counter for itchy, watery eyes. See your pharmacist to determine which product is best for you. There are other options available to treat your allergy symptoms by prescription as well, these products would be used at the discretion of your physician if your symptoms are severe enough to warrant their use. -Corticosteroids: These products are used to decrease inflammation associated with severe allergies. They are most commonly used for severe allergic reactions and asthma. -Nasal steroid: these are a subclass of the corticosteroids, they are most commonly used for individuals who need something stronger than what they can get over the counter for their allergies. Nasal Steroids are topical and have limited systemic side effects, your doctor can determine if these are right for your symptoms. -Nasal Antihistamines: these are topical antihistamines that have less of the drowsy side effects associated with many oral antihistamines, again your physician would determine if these are suitable for your symptoms. -Mast Cell Stabilizers: these are potent prescription drugs primarily used for asthma sufferers. They are used to treat mild to moderate inflammation in the lung tissues, because of their effects on the mast cell these products also help to relieve some allergy symptoms. Mast cell stabilizers are usually used in conjunction with a steroid or antihistamine because they take a few weeks to get to full effect. For severe allergy sufferes we would recommend you see an Allergist about “allergy shots.” Allergy shots are actually immunotherapy and are used for patients who suffer from allergies for more than 3 months a year. They help to build up your immune systems tolerance to the allergens that affect you most. Come see us if you have any questions about allergies! This entry was posted in Uncategorized and tagged allergies, Allergy, allergy meds, allergy season, rhinitis, severe rhinitis, spartan blog, Spartan Pharmacy, spartan pharmacy blog by spartanpharmacy. Bookmark the permalink.